we can help you build the rest. Have you ever wanted to start a women’s group… but just didn’t know how to take that first step? Are you worried the enthusiasm for your women’s group might fizzle after a few meetings… and leave you feeling disappointed? Are you afraid that you don’t know how to find – and connect with – like-minded women to join your group? These are all common concerns for anyone who is thinking about starting her own women’s group. never get started in the first place. But when you have the right information and the right advice you can eliminate all these concerns and make these problems completely irrelevant. And when you have the right step-by-step guide, you can ensure that your idea blossoms into a long-lasting women’s group that will provide you with support and encouragement for years to come. 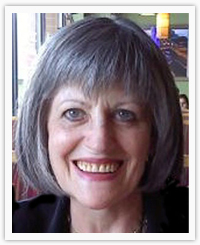 Hello, my name is Pat Brill and I was once just where you are today.I wanted to build a group of friendship, support, personal growth, encouragement… and I wanted to create a peaceful retreat where we women could talk about our lives, our dreams and even our problems with other women who truly cared.Sounds great, right?The problem was I just didn’t know how to get started. I decided to jump right in, and along with the help of my friend Karen Fusco, I managed to get my little group off the ground.Over the years Karen and I had to deal with all kinds of problems and issues. We made mistakes… but we learned from our mistakes.And today our little group is one of the most rewarding and enriching experiences in my life. Over the course of 14 years Karen and I have discovered that starting, building and growing amazing women’s groups can actually be very easy… as long as you have the right advice and the right information. We help all different types of women build all different types of groups. And we use our years of experience and success to help these women ensure their groups will be cherished by every single member – for years and years to come. To be quite honest with you, all you need to have is the vision and the desire to start this group. We can help you with the rest. I hope you are getting excited… because you should be excited! And with Essentials for Starting a Women’s Group, you are going to find the step-by-step guide that will get you started, keep your group positive and keep your group moving forward. It doesn’t matter what your vision might be. Essentials for Starting a Women’s Group will provide you with the information, the advice and the know-how needed to make it a reality. You need to have the vision… and we can help you with the details and give you the guidance to ensure your group is a success. When you start a women’s group you aren’t just scheduling a meeting of friends… you are building something that you – and many other women – will cherish for years to come. Your women’s group will provide support, friendship and encouragement. Your women’s group will allow for personal growth of every member. You women’s group can open your eyes to new experiences, offer you insight into your own life and even help you achieve your goals. 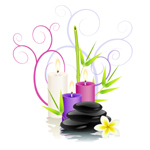 You might have been a part of another women’s group that fizzled away after a few meetings…. But it’s time to put those doubts away. 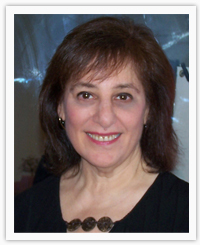 a lasting, successful women’s group… and that is exactly what you will find. Forget about all those doubts because they are no longer relevant. Karen and I have already made all the mistakes for you! We spent years going through all the trial and error, and we have discovered exactly what it takes to make great women’s groups work. We can provide the guidance you need to ensure that your group is not only a success… but we can also ensure your group always stays true to your original vision. With our book, Essentials for Starting a Women’s Group, we can help you build the strong, dynamic group that other women will admire. I understand that some women are a little apprehensive about purchasing the Essentials for Starting a Women’s Group eBook. And it’s simply because they have purchased some other book or guide in the past… and it was nothing like they expected it to be. I have read the other guides and other books on the market, so I know where this apprehension is coming from. These other resources just explain the history of women’s groups… or they give you the benefits you can receive from a women’s group… or they tell you cute and funny stories about women’s groups. With our eBook, Essentials for Starting a Women’s Group, we get right down to the “meat and potatoes” and give you the information you need to take that first step and the guidance you need to keep your vision moving forward. Essentials for Starting a Women’s Group is a solid and complete resource for any woman interested in starting her own women’s group. Are You Ready To Start Bringing Women Together? Both Karen and I believe that each small women’s group is another link in the chain that works to connect women all over the world. We believe that giving and receiving support from others changes who we are and changes those around us… for the better. Maybe you envision women coming together to help each other. Maybe you want to build new friendships, share a common interest, or leave your footprint on the world. Whatever your reason, it’s time for you to get started on your journey. It’s time for you to take that first step. for yourself and for other women around you. And you can take that first step and get started – today – building your own women’s group with the Essentials for Starting a Women’s Group eBook. Order Your Own Copy Of Essentials for Starting a Women’s Group Today! For about the same price you would pay for a book in the bookstore… you can order our eBook and uncover the steps, the secrets and the advice that will allow you to start your own Women’s Group. For only $27 you can discover how to build a group that will provide you with love, support, friendship, personal growth… and a little, happy retreat… that will last you for years and years to come. Now you just need the guide that will make your dream a reality. When you order Essentials for Starting a Women’s Group today, you are going to instantly receive the eBook directly to your inbox. No shipping. No waiting. You are going to instantaneously obtain a complete, step-by-step guide that will explain how you can take your vision and make it a reality. You will learn how to build your group and keep it growing stronger meeting after meeting. You will discover what “not to do” and you will be more than prepared for any problems or issues that might arise. But most importantly, you will finally have all the tools you need to build something you can truly be proud of. TODAY ONLY: Your Free Bonus Gift If you decide that you are ready to get started and order Essentials for Starting a Women’s Group today, we are going to give you this amazing free bonus gift. Sometimes coming up with fresh, interesting topics can prove to be the most challenging part of starting a great women’s group… but we’ve got you covered! 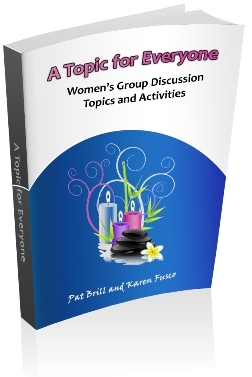 We’ve put together a fabulous list of possible discussion topics and activities for you and your women’s group to use. As your group grows and develops, you and your group will begin to find topics and activities you would have never envisioned – and they will be fun, interesting and relevant to your group and to the specific things you are dealing with at that time. But until that ball gets rolling we are offering you a huge list of topics and activities… from finances to entertainment… from health to personality… from charity to goal-setting. And this book can prove to be a valuable resource for you in the future as well. At anytime you are in need of ideas, topics or activities for your group you can always turn to this 25-page companion book and receive the perfect topic for any meeting. The retail value of this book is $8.34, but if you order today it’s YOUR FREE BONUS! Please Note: The FREE Bonus Gift comes along with the e-book version of Essentials for Starting a Women’s Group ONLY. If you, for whatever reason, are not 100% satisfied with Essentials for Starting a Women’s Group, we will honor our guarantee and instantly refund your money. No questions, no hassles and no problems. You have a full 60 days to read and use Essentials for Starting a Women’s Group without taking any risk. With your satisfaction assured and your purchase guaranteed, there is absolutely no reason to let this life-changing opportunity pass you by. 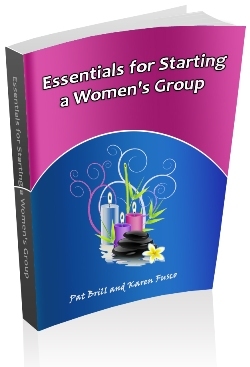 Essentials for Starting a Women’s Group is the step-by-step guide you need to quickly and easily start your own women’s group… without worrying about making mistakes. Then order Essentials for Starting a Women’s Group today! For ‘Essentials for Starting a Women’s Group’, Click Here! For ‘A Topic for Everyone’, Click Here! YES! Karen and Pat, I want this Incredible Package! I want to start a fabulous women’s group and I can’t wait to get started. I understand that while the value of this offering is $38.29, the price I will be paying today for this entire package is just $27.00! I understand that I will be able to gain access to the downloadable files immediately after I pay using the secure link below, any time day or night. I understand that my purchase is 100% Guaranteed, so there’s no risk to me. If I don’t like it or it doesn’t meet my expectations within 56 days, my money will be returned no questions asked. Just click the link below to get started. It’s EASY! Do it NOW! Once your credit card is approved, you will be taken to a special download page where you will download the e-book along with your FREE Bonus. specializing in digitally delivered products, just like these! © 2011 Boomers In Motion, LLC - All rights reserved.